Frankie Nelson of Swanton knocks down a three-pointer from the corner during Thursday’s win over Patrick Henry. The Bulldogs defeated the Patriots, 40-31. Bridget Harlett of Swanton hits a free throw Thursday versus Patrick Henry. Aricka Lutz of Swanton goes up for a shot as Kayla Prigge of Patrick Henry (21) defends. 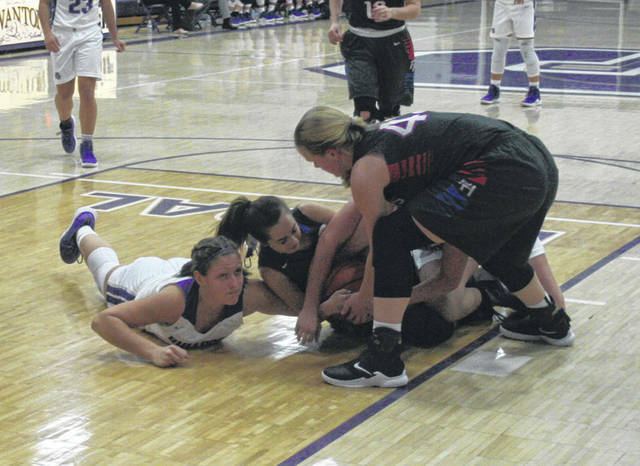 Morgan Pine of Swanton, left, goes for a loose ball during Thursday’s game. 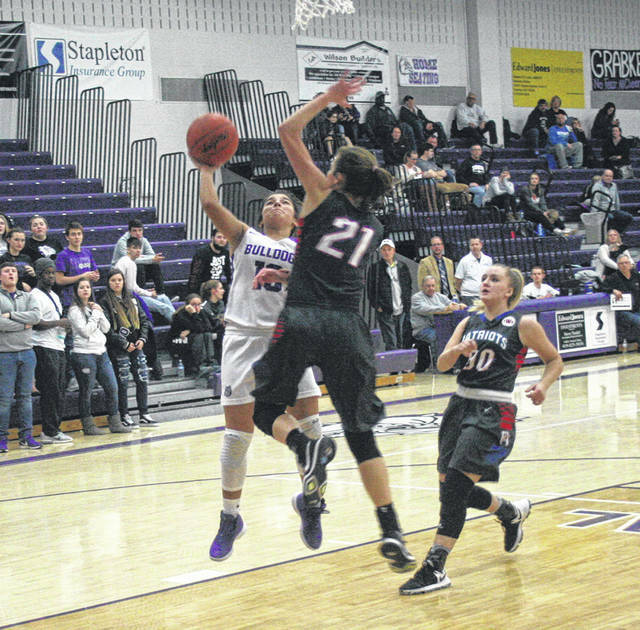 A suffocating defense helped lift Swanton to a 40-31 home win in girls basketball on Thursday. 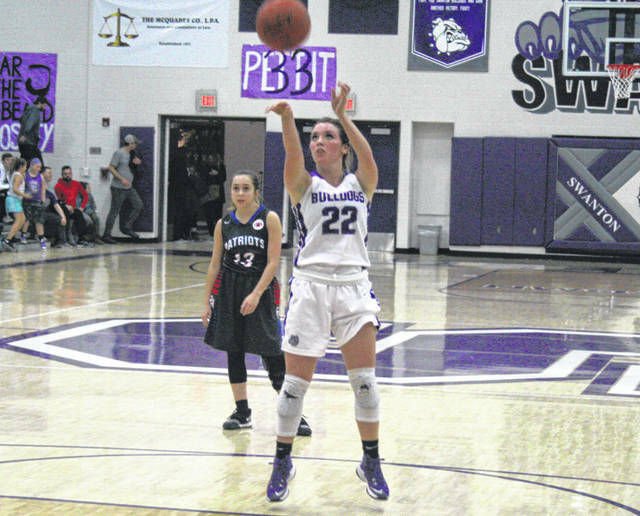 The Patriots did have a 13-point fourth quarter, but the Bulldogs had already built a sufficient lead, allowing them to hold on for a nine-point victory in Northwest Ohio Athletic League play. “Our defense was really good tonight I thought,” said Swanton coach Eric Oakes. “Just getting after it. I told the girls, ‘we’re gonna play fullcourt (pressure defense) non-stop, the entire game.’ They were ready to do that. Bridget Harlett’s just everywhere. She has been all year. She may miss a steal, and she’s getting it five seconds later. In the opening quarter after the Patriots cut the Bulldog lead to one, Swanton went on a 7-2 run to end the period. Grace Oakes banked in a three-pointer and Aricka Lutz followed with a steal and score. MacKenzie Vance scored inside for PH, but a floater from Ashlynn Waddell of Swanton put the difference at 12-6 after one. Swanton also had a 7-0 run in the middle of the second period to extend its lead. Averie Lutz converted a drive to the hoop, Frankie Nelson knocked down a triple, and two free throws for Harlett put the Dogs up 20-10 with 3:04 left before halftime. Scoring 40 points can be considered rather underwhelming, however, the Dogs did just enough on that end of the floor to outduel the Patriots. The Dogs continued to increase their lead in the second half. A Harlett free throw started a third quarter push from the Dogs. After two missed attempts at the foul line by PH, Averie Lutz layed one in at the other end, Harlett converted a fast break opportunity and Averie Lutz split a pair at the line. Kayla Prigge then went 1 for 2 from the line for the Patriots, making it 30-18 after three. Swanton got 1 of 2 free throws from Jessica Dohm, plus a drive and score by Averie Lutz to give them a 15-point lead early in the fourth quarter. 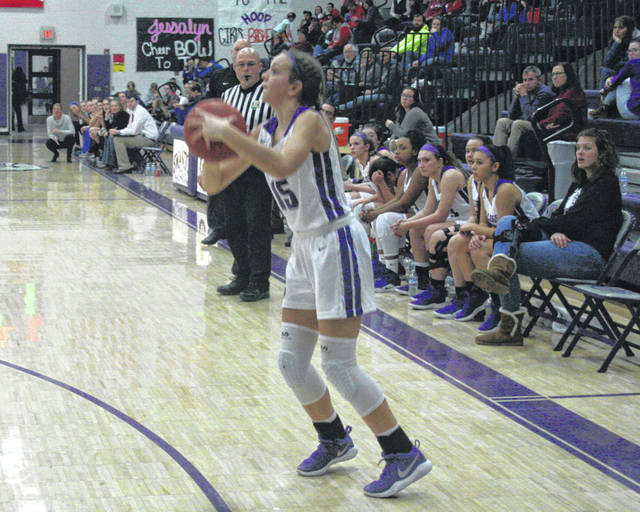 The Patriots would not be able to get back within single digits until the closing seconds, when Olivia Thompson ended the game with five straight points. The victory capped a good week for the Dogs. After falling in league play to Evergreen the week before, Swanton also defeated Defiance last Monday 35-29. Averie Lutz led Swanton scorers with nine points. Nelson added eight, while Harlett and Grace Oakes each had seven. Thompson notched a game-high 14 points for PH. Swanton (8-6, 2-2 NWOAL) is at Maumee (4-14) Tuesday before hosting Wauseon (6-11, 1-3) in league action Thursday.